There are several factors that affect color reproduction when capturing images under the microscope. It is important to keep color reproduction as consistent as possible in digital microscopy. You can read more about the importance of color reproduction in scientific images here. Colors are often referred to as "warm" or "cool", and this relates to color temperature. 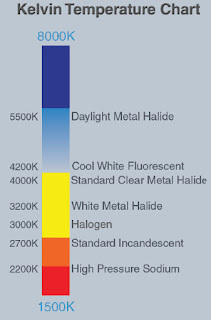 Color temperature is measured in Kelvin (K). It is a bit counter-intuitive, but higher temperature colors are called "cool colors" (such as blue or white) and lower temperature colors are known as "warm colors" (reds and yellows). Microscope light sources vary with color temperature. Daylight is regarded as 5000 K and a halogen lamp has a temperature of around 3200 K. Microscope filters can be used to raise or lower the temperature of the light source. Color temperature isn't everything though, a variety of light sources may have the same color temperature, but have different spectral properties. Also, color temperature isn't a reliable prediction of how specimens will be viewed and processed by the microscope imaging system. CCD microscopy cameras and CMOS microscopy cameras can be adjusted electronically for white balance. However, the light sensing elements of these sensors are monochromatic and a color image is obtained by detecting the light that passes through red, green and blue (RGB) filters, which cover each individual pixel in the sensor array. 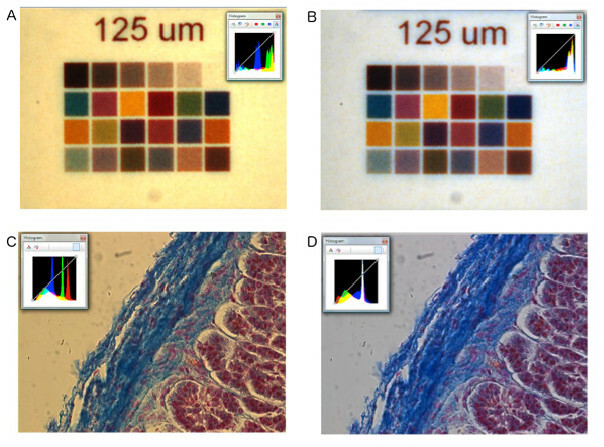 Different microscope cameras have different color correction systems. The software alone controls some systems and others require both software and hardware adjustments. Some settings cannot be altered by the user, meaning it is important to select a camera that has good color reproduction and color correction. Lumenera has designed one software adjustment system for use in their cameras and specific applications called Color Correction Matrices, which uses a color reference matrix to compare each color component of the image. White balance is the process of removing unrealistic color cast in an image. Because light sources vary in color temperature, this will have an effect on the white balance of an image on screen or captured by a camera. The example below shows images before and after white balance has been applied. A - Microscope slide color chart. B - Microscope slide color chart after white balance. C - Feline Adrenal gland stained with hematoxylin and eosin stain. D - Feline Adrenal gland stained with hematoxylin and eosin stain after white balance. Images were captured with an Olympus BX51 biological microscope using a halogen lamp with daylight filter and an Infinity 3-3URC microscope camera. White balance adjustments should be performed anytime the lamp intensity is altered or filters are inserted into the optical path. Color reproduction will vary between monitors. Monitors must be calibrated when first installed. Calibration should be performed at regular intervals over the lifetime of the display. Additionally, if correct color balance is important for imaging of samples, a medical display monitor is recommended. These specialized monitors offer a more accurate reproduction of color than standard monitors.